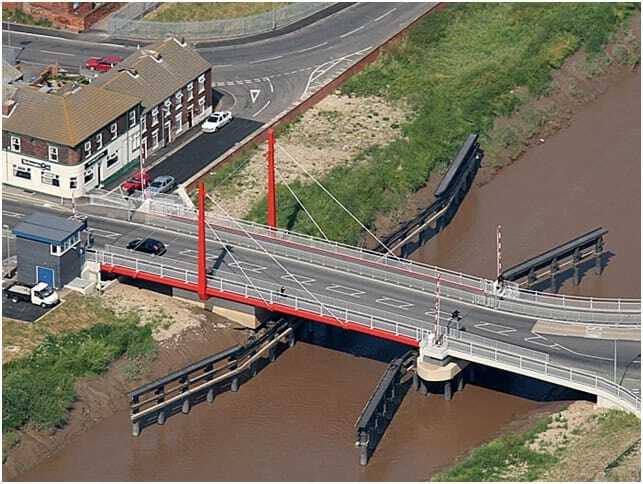 Mason Clark Associates carried out detailed design and project management for this award winning scheme to replace the bridge over Dutch River in Goole. Also included in the scheme were safety improvements to the junctions and approaches along with improvements to existing cycle and pedestrian facilities. A range of environmental and sustainable features were incorporated into the scheme. The Dutch River Bridge carries the A161 over the navigable Dutch River in Goole. The bridge consists of a 40m cabled stayed swing span and a 20m fixed span. Flooding and tidal flow were of particular concern to the environment agency and careful negotiations were required to ensure that the scheme obtained approval. Extensive works were required in the fast flowing tidal waterway and these included driven steel tubular piles for temporary and permanent bridge piers and fendering. Steel fabrication for the moving span was carried out off-site, and seven large units were then assembled on site to give the final curved deck profile. The steel towers and cables complete the impressive swing span which has a slender curved profile. Complex operating systems are required to move a structure of this size. Care was taken to design and construct a system that would operate the bridge safely and efficiently, but was easy and cost effective to maintain. The operating system combines electrical, hydraulic and electronic equipment to enable the bridge to be operated automatically with a swing time of 90 seconds.